River tug REGARDER in the docks. Was she a Cory? The motor tug REGARDER (69 tons gross; 500bhp) was built at the James W Cook(Wivenhoe) Ltd shipyard and completed in July 1958 as REGARD for Cory Lighterage Ltd, London. In 1982 she was sold to Erith & Dartford Lighterage Co Ltd, Erith, and renamed SIR JAMES D. It was with that firm for a couple of years and in 1984 went Braithwaite & Dean Ltd, London, and got back her original name REGARD. 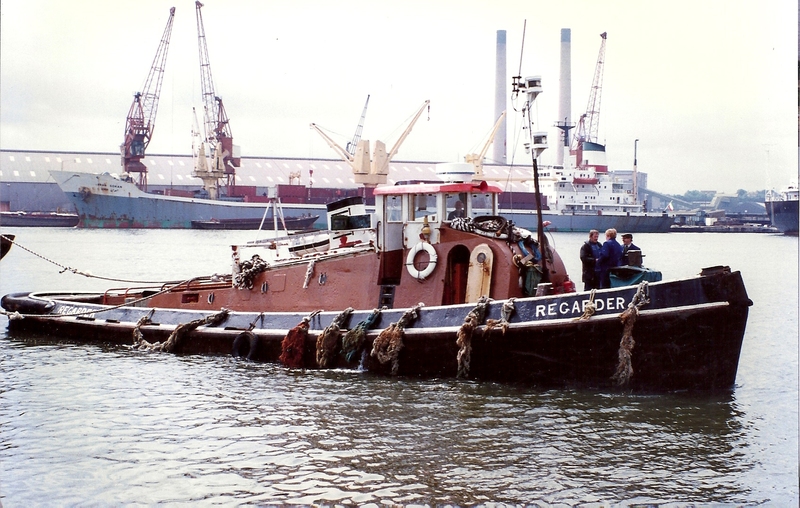 Alan C Bennett & Sons Ltd, Rochester, bought her in 1991 and she was renamed REGARDER. Retaining the same name, she went to General Marine Ltd, London, in 1994. As far as I know she is still in service and based in the Wapping area.